Closing the month of March means a prolonged holiday in the Nordics due to Easter, a good opportunity to scribble notes and observations about what happened in the lil' Scandinavian ecosystem for the past 30 days. - Very slow month in the Nordics from an investment activity perspective. - So far we have 50 deals tracked for the month of March, 8 less than 58 recorded in February, 48 (!) less than the 98 investment deals tracked for March 2017. The March 2016 number? 70. - 10 deals with undisclosed data vs 17 for the same month last year. - However, the Nordics registered more $ investments in the first 8 weeks of 2018 than for entire Q1 of 2017. - Q1 2018 vs Q1 2017 in two little graphs? - What are the top venture capital companies in Sweden - two outsiders in a usual suspects list. - All data is here. - According to the official figures provided by the Swedish government, the top investments in the economy for 2017 were in manufacturing, energy and transportation. The breakdown follows the one from the private investment market. - Also in Sweden, the number of doctors per people has increased by 20% between 2005 and 2015. However, Sweden's aging population reflected an increasing need for care which apparently is the main cause for long queues and medical accessibility. Yes, the health care is mostly free for the taxpayers in Scandinavia but the waiting lists are a very big problem of the system. Another underlying justification for health care to be a top vertical for risk capital capital allocation in 2017. - The Swedish Medicines Agency received a total of 108 complaints regarding Natural Cycles, the Swedish company providing a fertility tracker technology that helps prevent pregnancies. Not fun. - The number of new registered electric cars in Norway was about 143k at the beginning of 2018, 40% yoy increase from previous year. - Finland subsidizes e-bikes, with a budget of €16.3 million over 3 years - €400 per bike, covering 40615 bikes. Other recent programs for e-bike subsidies include €35 million in Sweden, €200/bike in France, €1200/cargo e-bikes in Oslo. - Uber Sweden currently has 190,000 active users and over 1,500 drivers. Good context for crunching the numbers in the car sharing model. - Spotify’s margins are completely at the mercy of the record labels, and even after the rate change, the company is not just unprofitable, its losses are growing, at least in absolute euro terms. 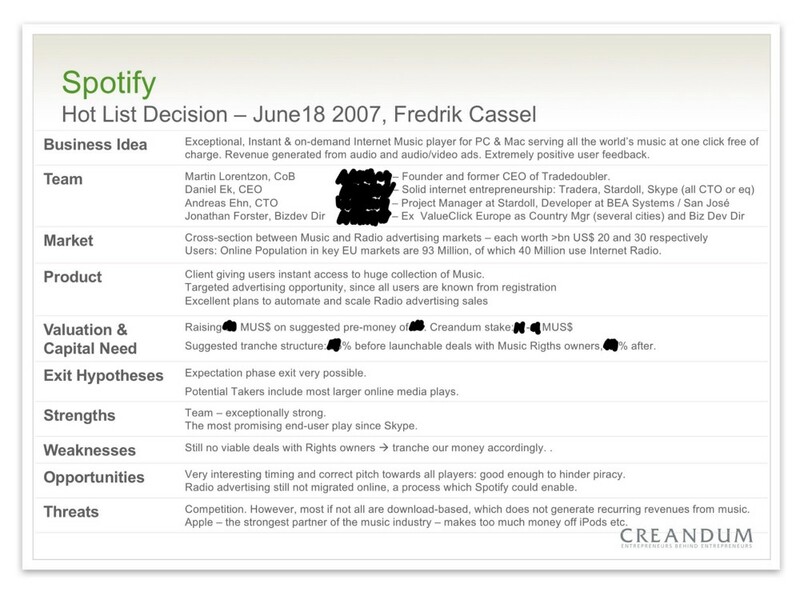 - Speaking of Spotify: Spotify Hot List Decision - June 2007, Fredrik Cassel summary is a good overview of investors' job in assesing all sorts of funding opportunities. Life is a struggle sometimes and Scandinavia is not exactly known as a place to find and fund the next Google Spotify on yearly basis, but once in a while you stumble on gold, sometimes you see it, sometimes you don't. It'd be easy to comment post event as a kibitzer, suffice it to say the Scandinvian ecosystem is certainly different than 10 years ago with more investment experience and money than fundable projects, lessons have been learnt, and Spotify is a great Nordic success story on lots of dimensions. - Meet Vagn Sørensen, the Dane who sits in 11 boards in 7 different countries. He is a chairman in 6 of them, is also an advisor to EQT and has a burning passion for rock'n'roll. - The Swedish, state-owned, investment firm Industrifonden lost two people in March - the big boss, Anders Slettengren, who went to Ratos as Senior Investment Director, and a middle manager, Björn Bergström, who switched the barricades to get operations experience from the risky startup world at NA-KD. - Finland’s government investment arm Solidium has acquired a 3.3% stake in Nokia for $1bn. - Overheard on stage at the Nordic Scale-up Summit: only 4% of startups ever make it to SEK 5M ($600k) revenue. - Finland launches the Finnish Startup Permit for founders coming from outside EU. Before sending your Startup Permit application to the Finnish Immigration Service, you must get a favorable assessment from Business Finland. Business Finland evaluates whether your business model, team and resources show potential for rapid international growth. After the assessment you will receive an Eligibility Statement to be attached to the Startup Permit application. Pretty cool and forward thinking, as opposed to kicking out the developers from your country, like in Sweden. - Kahoot valued at $100M, aiming for 100m users. Apparently there's been some disagreement about the future direction of the company between the former CEO Erik Harrell, installed in April 2016, and the board which seems to favor the Spotify's model of growth. As a consequence, now Kahoot is CEO-ed by one of the co-founders, which actually reflects the board's total control, in a context where the company rather needs a professional CEO for managing its growing ambitions. - More Scandi protectionism: The Danish government will close a loophole that would allow immigrants who could prove they were positively contributing to society to stay in the country. That means that other immigrants already with papers in order may be kicked out. i) She launched Collector in 1999, a financial service company which started offering banking services in 2015.
ii) In 2016 Collector started investing in startups from the financial industry as Collector Ventures and together with NFT, which is joint venture with Swedish media group Bonnier. NFT also invests in startups disrupting the financial services. iii) Since then, NFT and Collector made a total of 36 investments. Besides those, Lena Apler herself is an active individual investor, we tracked 12 of her startup investments, mostly in, you guessed, financial services. On top of that she is also an LP in other investment firms. iv) One of Collector's (and NFT) portfolio company (Enkla), announced its intentions of starting a price war on the mortgage market. They were followed shortly by Collector Bank, and then as a snowball effect, another Lena Apler's investment, Bofink, announced similar intentions. v) Those are fresh-blooded, new types of companies, outsiders challenging an ossified banking system. - Bonus related reading: the reality is always more complicated than theory. - Reaktor and the University of Helsinki started a free online course teaching AI. Reaktor the FInnish software company, not Reaktor Ventures, the Finnish seed investor. - Robust North used its product, Arilyn One, to develop a cool Augmented Reality project for Suomenlinna, a Helsinki-based 18th-century sea fortress and nature area with centuries-old artillery and defensive walls, spread across 6 linked islands. - Nordic Choice Hotels, owned by Petter Stordalen, have entered into a partnership with the Swiss company Winding Tree for a blockchain collaboration, looking for new ways of distributing inventory, as an alternative to Expedia, Priceline and the likes. They have a pilot in place at Hobo Hotel in Stockholm, working on a so-called ‘testnet,’ where teams will gather qualitative data on transaction throughput and latency of the network. With some questioning the future scalability of blockchain platforms, it is argued that this will be vital in shaping core parts of the smart-contract before migrating to the ‘mainnet’, where transactions will have economic value. - Some of the Stockholm's apartments are heated with excess heat from data centers. - The Ikea manual of the future looks amazing - using 3D modeling and a bit of post-production trickery, Adam Pickard created a concept called AssembleAR, which imagined that Ikea’s instructions were rendered in augmented reality. After scanning the barcode on the box, you could literally lay the step-by-step models right next to your actual built project.